We have now completed this years round of renewals and unlike previous years, we have opted to send physical letters to all members that include a membership certificate. We choose to take this extra step because of the number of requests we have from members who were unable to print their certificates online. This took our volunteers a lot of extra effort, but when you receive your certificates in the mail I'm sure you'll agree the effort was worth it. Our membership renewal is slightly down on last year, which itself was decimated by the prior years madness in the market, but new memberships have help make-up for the loss and we are pleased to see that membership is actually on a year-on-year increase. The expected HST registration was not implemented as expected. To be honest, we just ran out of time and resources, so we are now looking at a date of 1st December. This is good for those inspectors that want to join up as the expected 13% HST increase won't hit the membership until then. The delay also allows us to get some last minute glitches a with the online payment system fixed so we can offer discounted Inspector products directly through the association. If you haven't yet renewed, now's the last minute opportunity to get in before the HST addition. We launched the Ontario Radon website this week to coincide with the push we are making to have all homes in Ontario measured for Radon as part of the Real-Estate transaction. While November is traditionally known as "Radon Awareness Month" we are trying to get the message across the radon doesn't have a calendar and it will infiltrate homes any time of the year. We published the OCRMI protocol and traffic-light reporting system at our conference back in March and members will see more and more in the way of marketing to try to eradicate indoor radon levels across Ontario. Over 850 Ontarians die every year from Lung Cancer caused by radon and this has to stop. 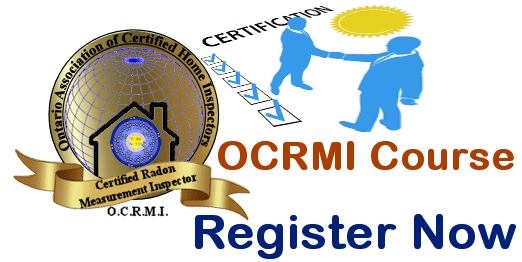 Ensure you are recognised as an OntarioACHI Certified Radon Measurement Inspector (OCRMI) and start offering these services to all your clients. You might just be the Inspector who saves a life (or two). The first course in Toronto on 22nd November is nearly sold-out. Book now to reserve your place. Can't make this course? Want to see one in your area? Contact Len Inkster at leni@ontarioachi.ca to request a local course date. We will be having another meeting with the TARION warranty corporation on November 21st to discuss and hopefully finalise training for inspectors who wish to be recognised as OntarioACHI Certified New Home Warranty Consultants. We will be advertising this certification across Ontario and providing courses over the next couple of months. The courses, which will be a mixture of TARION provided information and education courses and OntarioACHI developed standards courses and presented jointly by TARION and OntarioACHI. The Certification will identify Inspectors who can support clients through the various levels of the TARION warranty program, supplying information that helps consumers identify items that need to be entered on TARION warranty claims. Please check our website for updates. We will be adding the courses under "upcoming courses"
Join 30,500+ industry professionals at The Buildings Show, North America’s largest annual exposition, networking and educational event for design, architecture, construction and real estate. Together with HomeBuilder & Renovator Expo, PM Expo, STONEX Canada and World of Concrete Toronto Pavilion, Construct Canada will provide you with the tools needed to sharpen your skills and continue your professional development. 7 CPD credits for each day attended. OntarioACHI is sponsoring the 2018 CAHPI Conference. This year's conference is being held in Ontario at the Pearson Sheraton in Toronto on November 30th. We recommend you come along to members from OntarioACHI and discover how CAHPI can represent your needs at the national level. CCHI holders can instantly transfer to the CAHPI NCH. With a signed affidavit for a list of 250 inspections, as an OntarioACHI CCHI, you can also advance to the CAHPI Registered Home Inspector - RHI designation. We will be announcing a reciprocal arrangement for RHI's who wish to have OntarioACHI support them at the provincial level. The 2019 OntarioACHI Annual conference and exhibitors showcase will be held on February 19th to 21st, 2019. The conference will be at the Mohawk Inn and Conference Centre, Campbellville, which is at the junction of the 401 and Guelph Line, just south of Mohawk Racetrack. We explained last month about the format changes that will help attendees and exhibitors get more from this conference. We are hoping to have some existing new exhibitors, services and products for Inspectors. This conference we will also be focusing on the ways in which inspectors can improve their income and strengthen their businesses. We are still actively seeking assistance from Members who wish to be part of the Conference Committee. Work on the committee is worth 12 hours of Professional Development Credits (CPD) to apply to your CCHI commitment. Contact the secretary @ ontarioachi.ca for more information.